Signtronix, the largest sign company for small businesses across America, has opened a new office in Wichita, Kansas, which will be headed by John Fore, the Regional Manager. At Signtronix our goal is to provide beautiful and eye-catching signs to the small business owners of America. John Fore is new to the Signtronix family and comes from a strong advertising and marketing background, so he understands the importance of constantly marketing a business in order to gain new customers. Signtronix (http://www.signtronix.com) is the premiere sign manufacturer for small businesses across the United States. The company was founded in 1959 and has helped over half a million customers in its 50 year history. Signtronix offers many different sign products from outdoor electric signs, LED messages signs and indoor and window signs to help America’s small businesses get the exposure they need to their passing public and potential customers. Signtronix is proud to be an ESOP (employee stock ownership plan) company which is owned and operated by its employees. If you wish to view Signtronix on Facebook then visit http://www.facebook.com/signtronix or you can join us on Twitter at http://www.twitter.com/signtronix. 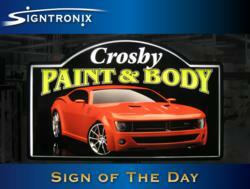 To learn more about Signtronix please contact Tom Johnson Jr. at trj2 (at) signtronix (dot) com.